If you’re working in a professional environment you may hear the word strategy a lot. But, what is strategy exactly? Our strategy is to sell directly to consumers. Our strategy is to be number 1 in EMEA. Our strategy is to grow through acquisition. Our strategy is to grab market share first, then worry about profit. Our strategy is to position ourselves at the high end of the market, enabling us to charge premium prices. What do these strategies have in common? Well, for a start, none of them are strategies. Instead, they are components of a strategy, or in some cases, they are simply goals. Targets to hit. But they are not strategies. If we now know what strategy isn’t then… what is strategy? A simple way to understand strategy is to examine the origin of the word ‘strategy’. It derives from the Greek word strategos, which means ‘the general’s art’. So if strategy is the general’s art, what does a general do? The answer is that they coordinate the whole with the aim of winning the war. This is the essence of strategy. To coordinate the whole to achieve a goal. The general has the goal of defeating the enemy, but it’s strategy they use to achieve this goal. The general might decide to engage in some battles and retreat from others. They will sometimes feint areas of strength. They will try to play to their strengths. They may even sacrifice teams to achieve their objectives in other areas. What they won’t do is launch towards the enemy on all fronts at the same time. 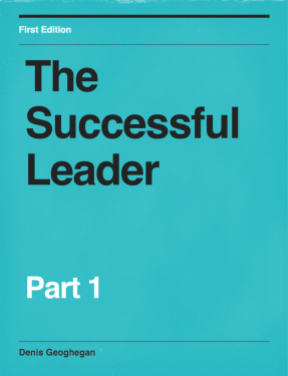 You can think of management as being tactics, and leadership as being strategy. Turning again to our general, they are the leader. They coordinate the whole (the strategy). They are trying to do the right things. The commander on the battlefield. They are the manager executing what the general has told them to do. They choose how best to coordinate their men (the tactics) to achieve what the general has asked them to do. 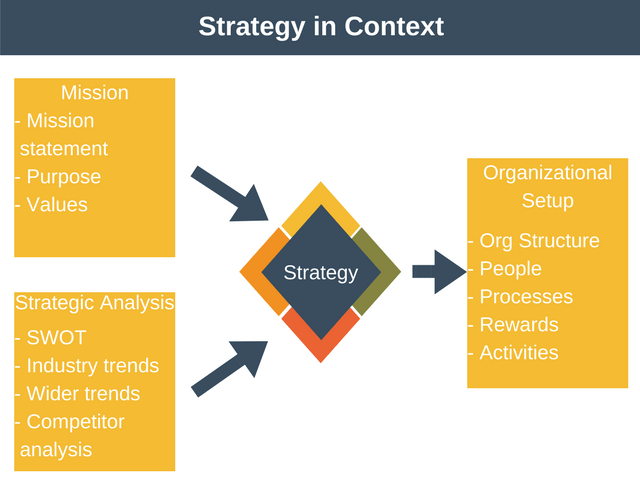 Let’s examine how strategy fits within an organization. This will help further deepen our understanding of strategy. This is our big goal and our values. In the general’s case, their mission is to defeat the enemy. Their values might be to obey the Geneva convention and treat every individual with the same respect. Analysing your strengths and weaknesses (SWOT analysis). These are just a few of the tools available as inputs to strategy creation. Organizational structure: setting up the organization so it can execute the strategy. People: what people should we employ? For example, should we focus on hiring great designers, or should we hire great customer service people? Processes: what processes should be in place to support the strategy? Rewards: how should we align rewards with the objectives of the strategy? In essence, the practical details about the organization should be a direct consequence of our strategy. What is Strategy? Do I have a Strategy? With all that background information out of the way, it’s finally time to create our strategy. To create a strategy we must be able to answer the following five questions. (Note that these questions have been adapted from the Strategy Diamond Model). What arenas will we compete in? What vehicles will we use to get there? How will we differentiate ourselves to win? How fast will we move, and using what sequence? If we can answer all five of these questions then we know we have a complete strategy. If each of our answers supports and reinforces the others then have a great strategy. 1. What arenas will we compete in? To answer this question we need to get specific about the market we are chasing. What country or region are we going after? What sales channels will we use? What product categories will we focus on? How will we configure our value chain? 2. What vehicles will we use to get there? We know the arena in which we want to compete. Now we need to choose a vehicle to get us to the arena. This could be to build it ourselves, it could be to license it, or it could be via a partnership, amongst others. 3. How will we differentiate ourselves? Many managers assume strategy is about competing to be the best. It isn’t. It is about competing to be unique. Here we need to define how we differentiate ourselves. Will we have a better design? Or a higher quality product? Or a cheaper product? Or a more reliable product? 4. How fast will we move, and using what sequence? The speed of movement in business is important. Move too fast and you could end up getting ahead of yourself, growing too quickly, and going out of business. Move too slowly and the competition could get there first. Related to this is understanding the sequence of moves you will take. For example, your arena might be opening stores across China. But to avoid getting ahead of yourself you launch one store in Beijing first. Taking plenty of time to get the operational kinks ironed out, then expand as fast as you can. 5. How will we make a profit? Apple: profit based on high cost, underpinned by USP of great design. Ikea: profit based on low cost, underpinned by replication efficiencies. BMW’s arena is global professionals. Their value chain is set up to emphasize the active driving design philosophy. The vehicle they use to reach their market is their dealer network. Their differentiators are high quality, unique design, and high performance. Their steps are to increase the range of cars in established countries. In new territories, they establish dealerships in the capital and take it from there. Finally, their economic logic is to charge a premium price. 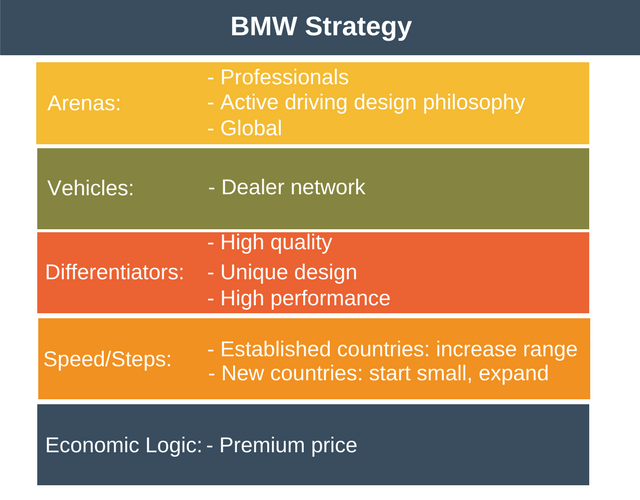 The real power of BMW’s strategy is where the answer to one question reinforces another. For example, by controlling the dealership experience they can ensure a high-quality sales experience. This aligns with the premium quality of their product. There is also alignment between high performance and professionals. There is also alignment between professionals and a premium price. If BMW were to partner with an existing dealer to supply their cars they wouldn’t have the same level of control over the sales experience. A strategy doesn’t only tell us what to do. It tells us what not to do. This means that BMW doesn’t make vans or trucks. BMW doesn’t partner with others on styling. It doesn’t make a single budget car. Their lower range cars are all at a premium price compared with competitors. By telling us what not to do a good strategy helps us make trade-offs and prioritize. There are many academics working in the field of strategy. As such, there are many ways to outline your strategy in addition to answering the questions given above. Do you have a USP compared to other organizations? Do you have a different value chain? Does your strategy tell you what not to do? Do your activities reinforce each other? Do you have strategic continuity? That is, are you creating unique skills and assets to match the strategy? Also, are you always working to improve the ways you realize the value proposition? If you can answer these 5 questions then you should have a good strategy. By now you should be able to answer the “what is strategy?” question posed at the beginning of this article. Articulating what is strategy can seem very esoteric at first, but at its core strategy is about controlling the whole to achieve a goal. Strategy tells us what to do as well as what not to do. It is important to set a strategy as otherwise, your moves are without aim. Your strategy will be tested every day. Without a clear strategy, it is very easy to get distracted.